Tim Berry is the chairman of Eugene, Ore.-Palo Alto Software, which produces business-planning software. He founded Bplans.com and wrote The Plan-As-You-Go Business Plan, published by Entrepreneur Press. Berry is also a co-founder of HavePresence.com, a leader in a local angel-investment group and a judge of international business-plan competitions. The plan-as-you-go premise is simple plan for your business' sake, not for planning's sake. Leading business plan expert Tim Berry invites you to block all thoughts of overwhelming, traditional, formal, cookie-cutter business plans and embrace an easier, more practical, modern business plan the plan that evolves with your business and allows you to start building your business now! "Only the father of business planning could forge classic planning fundamentals and 21st century realities into a new planning alloy. Tim Berry is that person and this book delivers that alloy upon which you can build your business." "Planning the small business equivalent of dental work? Maybe, but not if your plan is a tool a flexible, modular, guiding light of a tool. 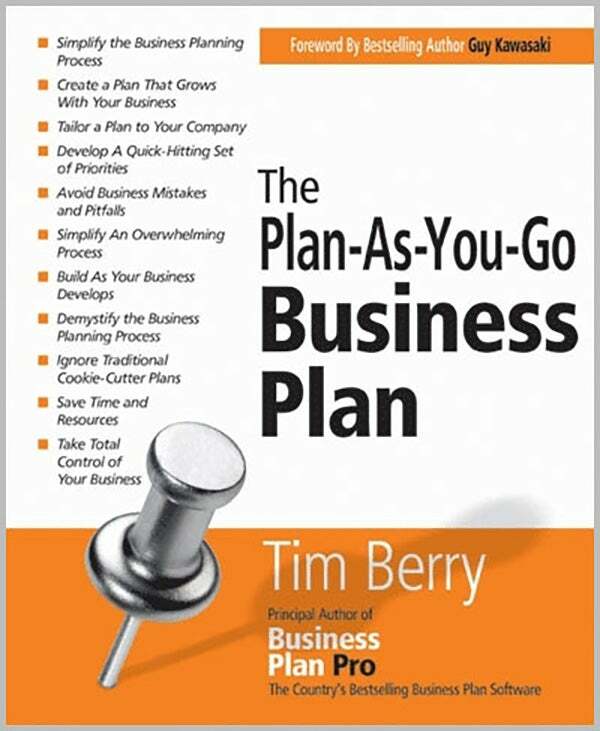 Tim Berry's The Plan-As-You-Go Business Plan is that kind of business power tool. Let it guide your vision and then just remember to floss!"